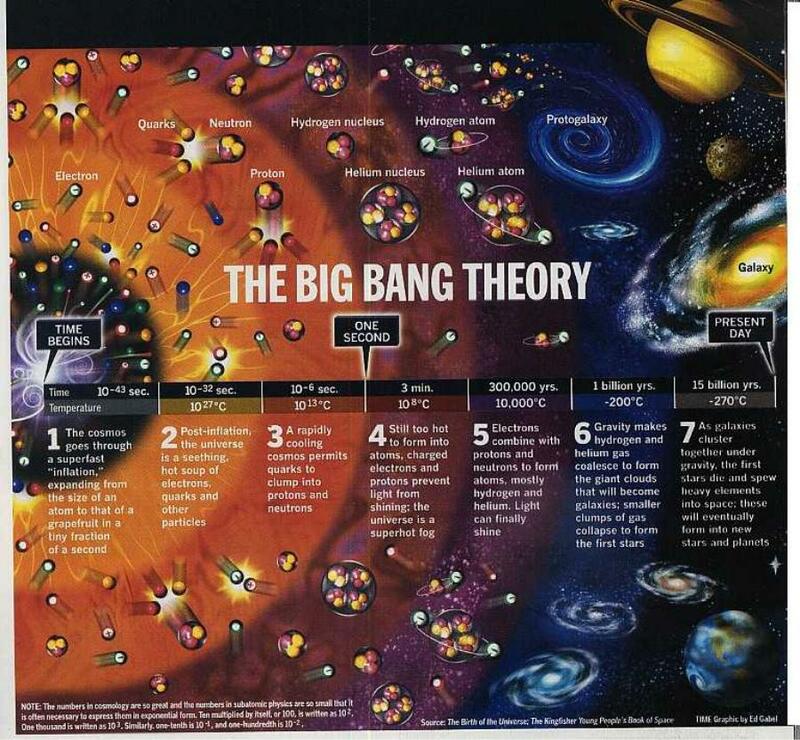 The big bang is considered to be the very start of the universe. According to experts, nothing is known about the pre-big bang period. There were no natural laws and nothing like time, light, and space had yet emerged in the original singularity. A fraction after the big bang, physical agents came into being, as well as the factors of time, light and space in a gigantic hot energy sea. Temperatures quickly began to drop. The energy sea was then able to ‘freeze’ or condense to form matter. The above-mentioned natural laws were already existent in the original singularity, albeit unable to manifest themselves without time, light, and space. The big bang, in my opinion, does not mark the absolute beginning of the universe. There were several explosions that – in the absence of the correct mix of physical agents and constants – imploded once more, richer by a learning experience. The pre-big bang situation represented a super symmetric numerical proportion of 1/3 matter, 1/3 spirit/memory, and 1/3 antimatter, in which the spirit factor, as a cocoon of all matter and antimatter, kept up the equilibrium of the balance. This is a precarious balance with an unbelievable amount of energy occupying an infinitesimally small space. In this incredibly small, high-energy environment, the wave-particles respectively the time-space continuum is permanent, without any static state. Any quantum fluctuation that is not adequately neutralized by the spirit factor serves as an initiator of the next big bang. This quantum fluctuation is a result of a conscious memory entity that causes the wave-particle duality to collapse outside the Heisenberg uncertainty principle, since the space is infinitesimally small.The spirit factor as a cocoon keeps the whole from bursting apart. What’s to be found in a spiritual cocoon ? This conscious memory entity is part of the spirit as a learning and evolutionary motor in the context of the creation of a sustainable universe that has become sufficiently evolved and balanced so as to avoid the implosion that would ordinarily follow. After several cosmic explosions and learning moments, the spirit factor was balanced enough to cause the big bang 15 billion years ago. In the case of a big bang, an inconceivable amount of energy is released into space. If the mix of universal physical constants and physical agents is not sufficiently balanced, an implosion will follow. All matter, antimatter, and energy implodes again to its original singularity, once more with a super symmetry of 1/3 matter, 1/3 spirit, and 1/3 antimatter.